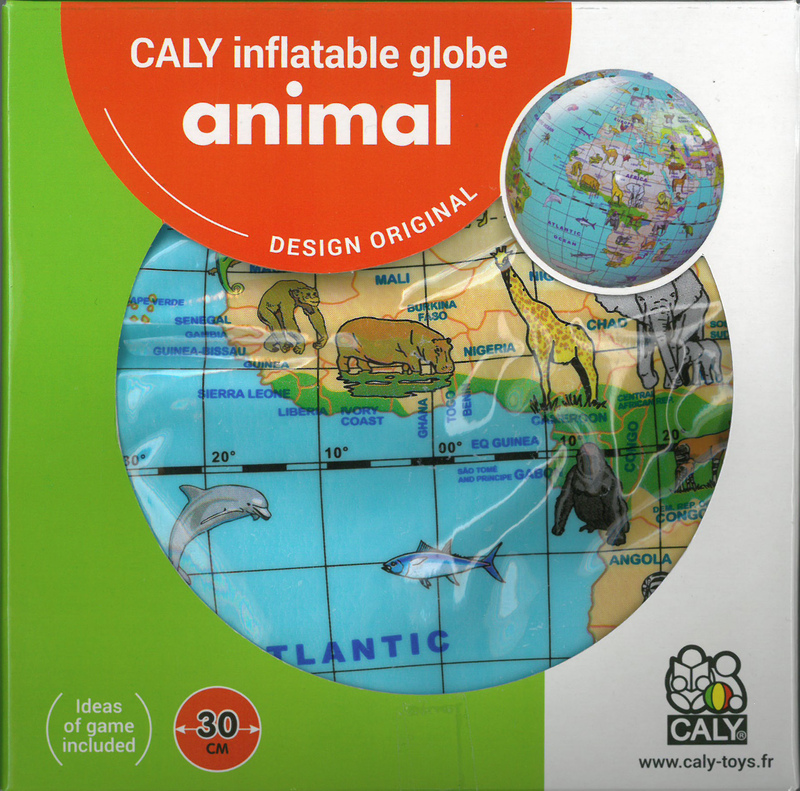 CALY TOYS is a French manufacturer of brilliant, unique inflatable globes, based in Marseille. 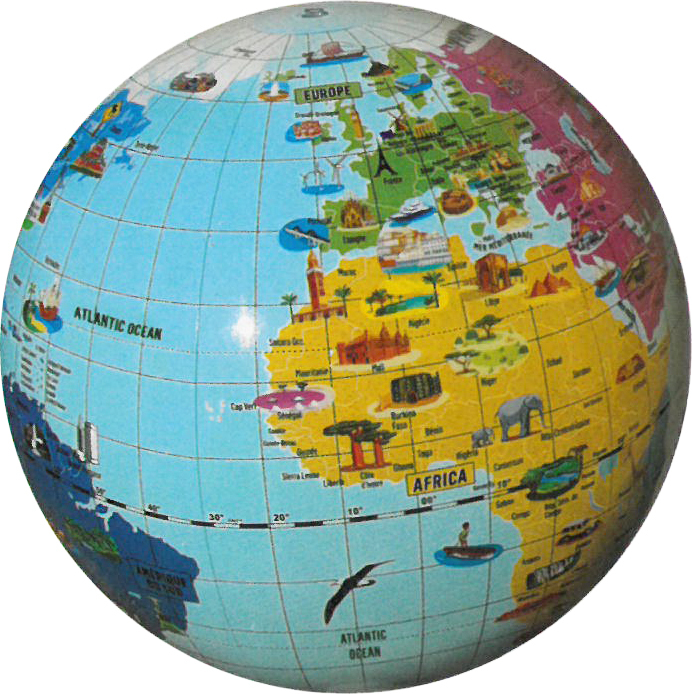 The maps of the political globes are permanently updated with countries names and capitals and the colours studied to please the children. 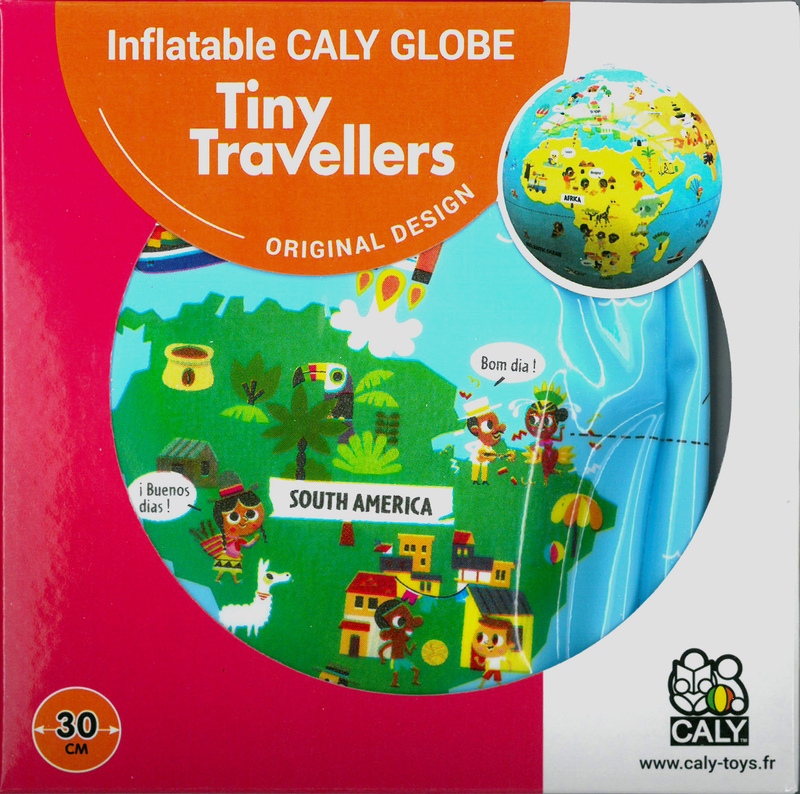 Caly – Toys used more than 6 different colours to make the globes when competition uses generally 3 to 4 colours only. 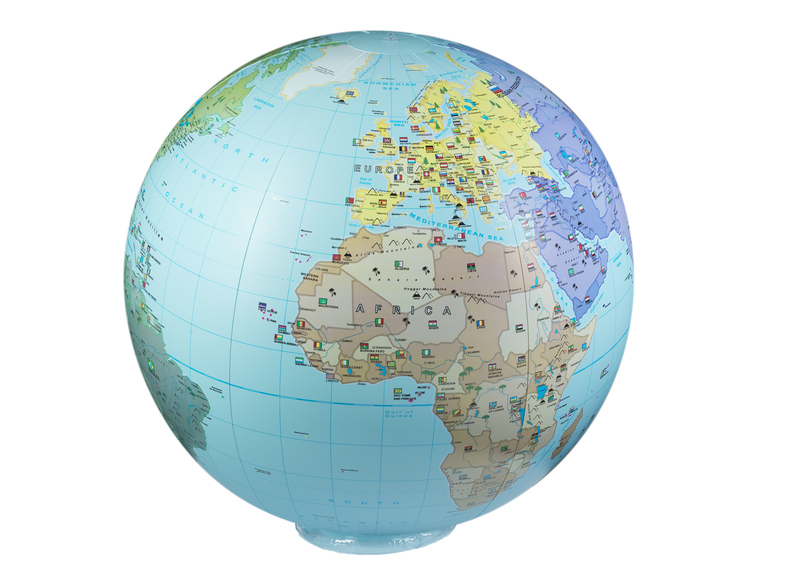 The "Maxi globe" has a 50 cm diameter, the "XXL-globe" has a 85 cm diameter, and is made of strong PVC complying with all the European safety standards. Caly – Toys has lately developed for the 30 cm a special printing technique to give the globe this amazing "Shiny" effect. The precision of the details is amazing and the brightness of the colours spectacular. The sense of touch is also very pleasant. These globes with labels are coming with a detailed instruction sheet. 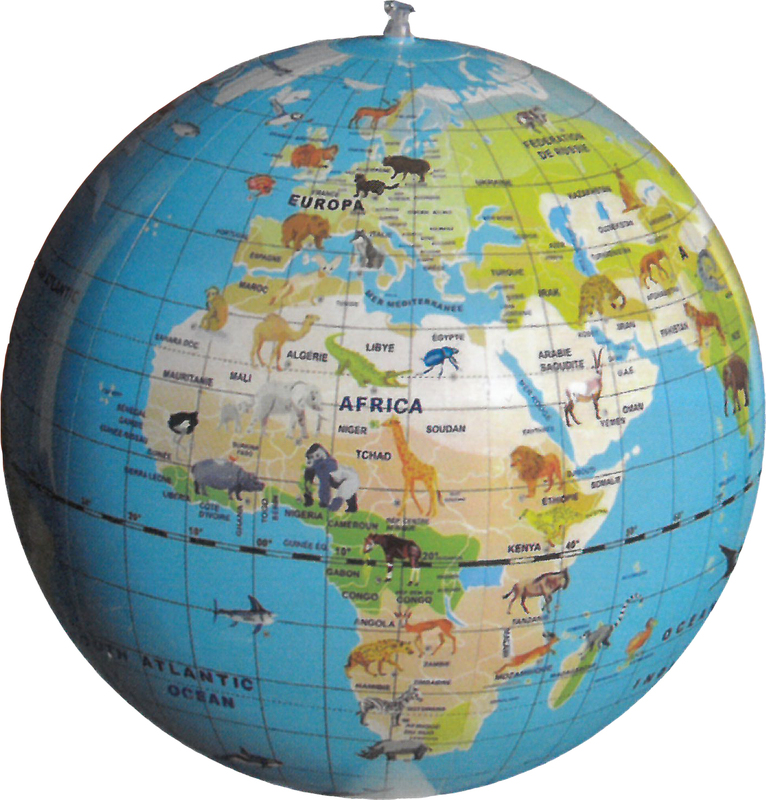 These globes are sold per 6 copies (price per piece in catalogue, please order by multiples of 6). 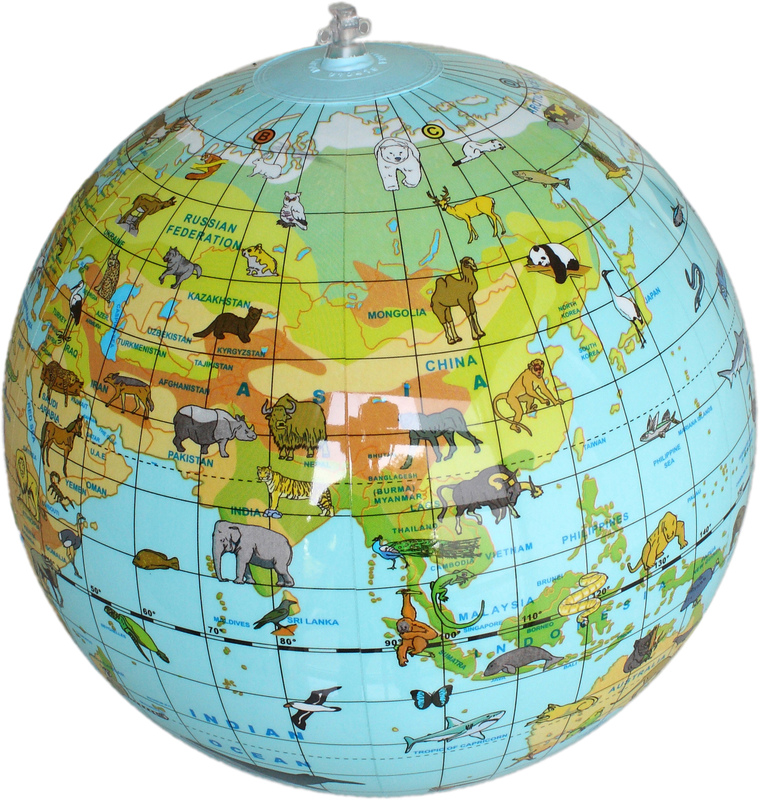 This 30cm Animal Globe is available in French, English and Dutch! 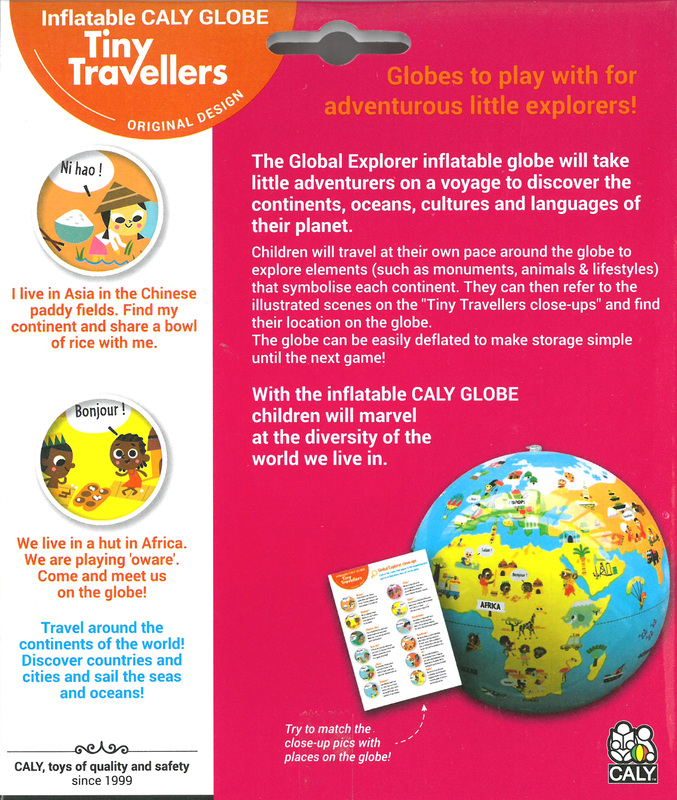 The Tiny Travellers inflatable globe will take little adventurers on a trip to discover the continents, océans, cultures and languages of their planet. 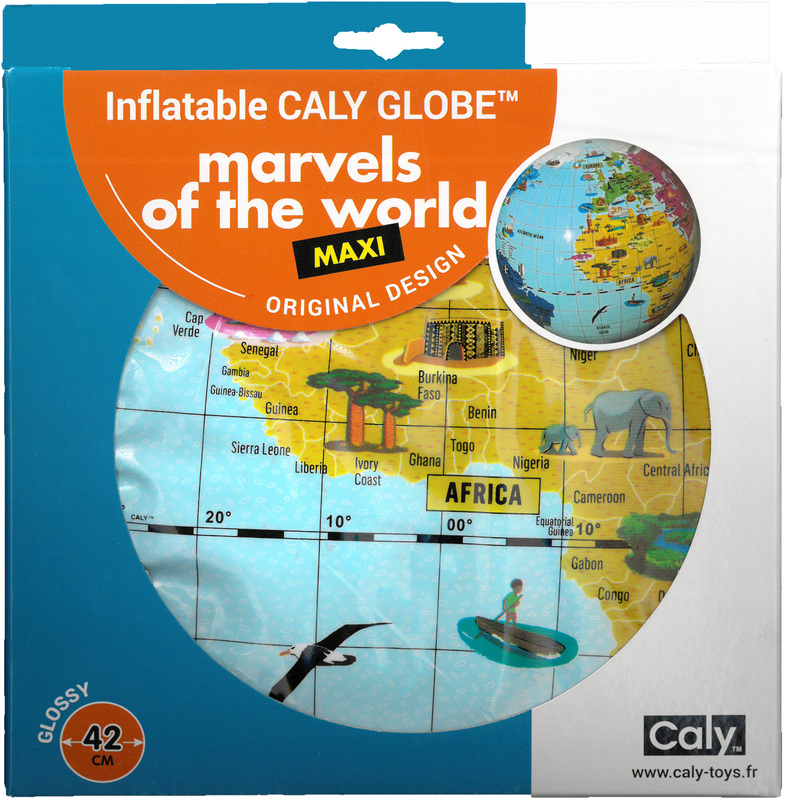 With the inflatable CALY GLOBE children will marvel at the diversity of the world we live in. 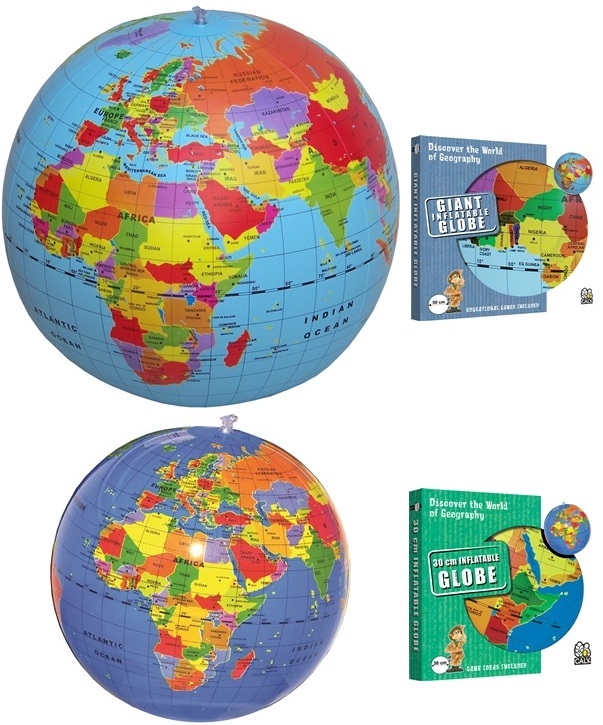 The box contains instructions for games and illustrated "close up" to discover on the globe. Children travel at their own pace around the globe to explore elements such as monuments, animals and lifestyles that symbolise each continent. They can refer to the illustrated scenes on the "tiny travellers close-ups" and find their location on the globe. 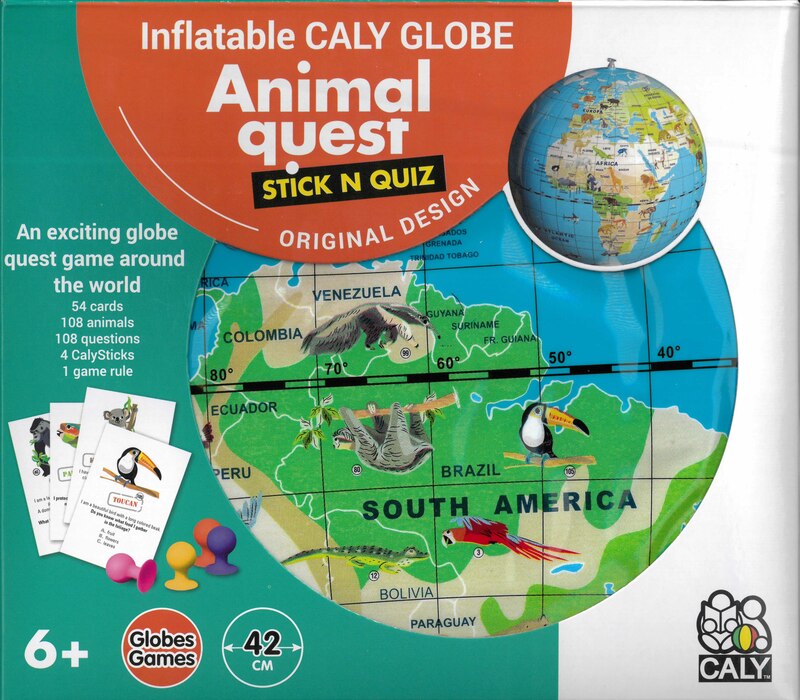 An enthusiastic game with inflatable CALY GLOBE "Animal Quest" (42 cm in diameter). 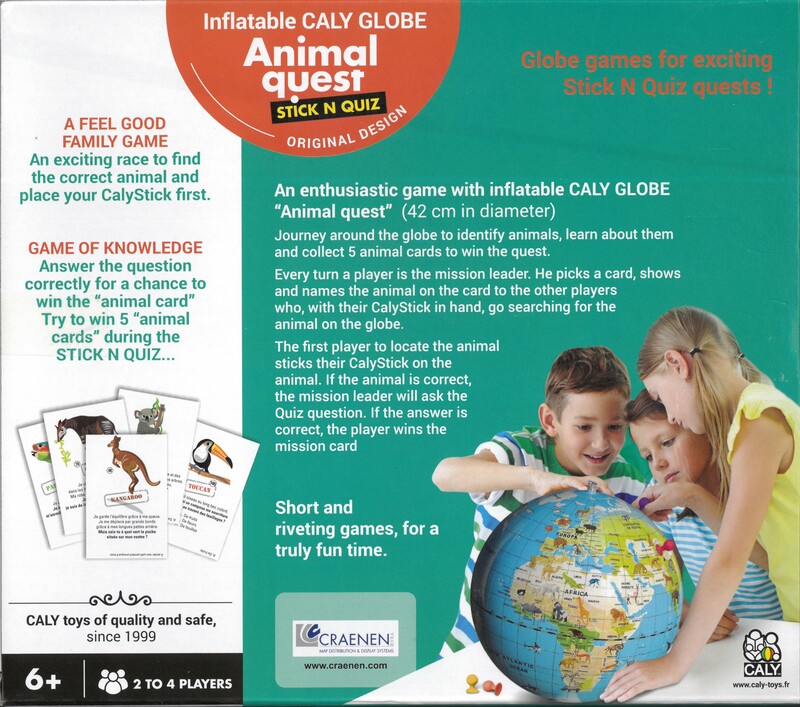 Game including:1 decorated globe, 54 colored quiz cards (108 animals), 4 CALYsticks. Travel far to explore the wonders of the world! 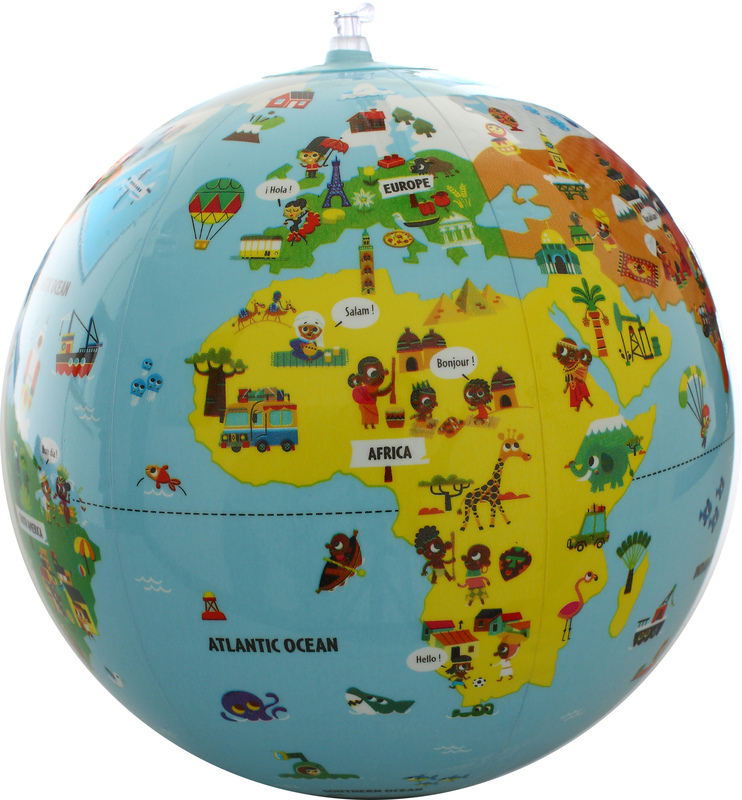 As children find their way around this graphic globe, they will discover high quality illustrations of interesting destinations. They are an invitation to learn more about the monuments and their history, natural sites and the diversity of nature. The shine of this glossy globe evokes the elegance of an unforgettable journey. As they venture around this globe, they will have fun and awaken their curiosity. Don't forget to study your leaflet! There you will find all the information on the illustrations, including location, monuments and animals. This is an inflatable globe dedicated to younger children around 3 years old. Today there’s a serious demand for toys for children younger in age. This product has a special function, as its name indicates it: ballast at the bottom allows special effect to the ball (self-righting, wobbling, zig-zag ...). 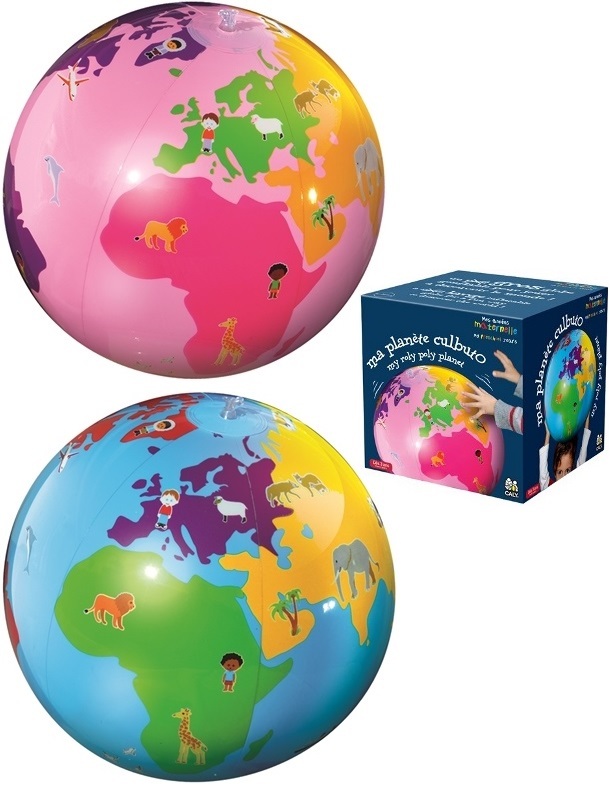 All the designs (from a Ravensburger designer) have been thought to adapt to that age: colours linked to continents, this is what they learn at preschool. The Roly Poly effect, too, to develop motricity. 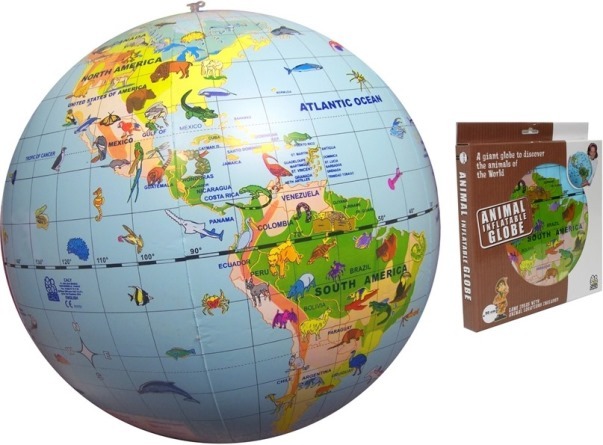 The globe comes in two colours: the 2 colours are just offered to the consumers, there is no colour "obligation" and, on the box, it is the same little boy who is playing with both colours. We have worked with a toy councillor with excellent references, to develop the product who told us that for that age, one of the most important things is to offer two colours as, at that age, this is when kids start to understand the difference between boys and girls and they are very attentive to differentiate each other and offering two colours is important to them. So we don't really refer to gender colour: we offer a concept adapted to preschool years. 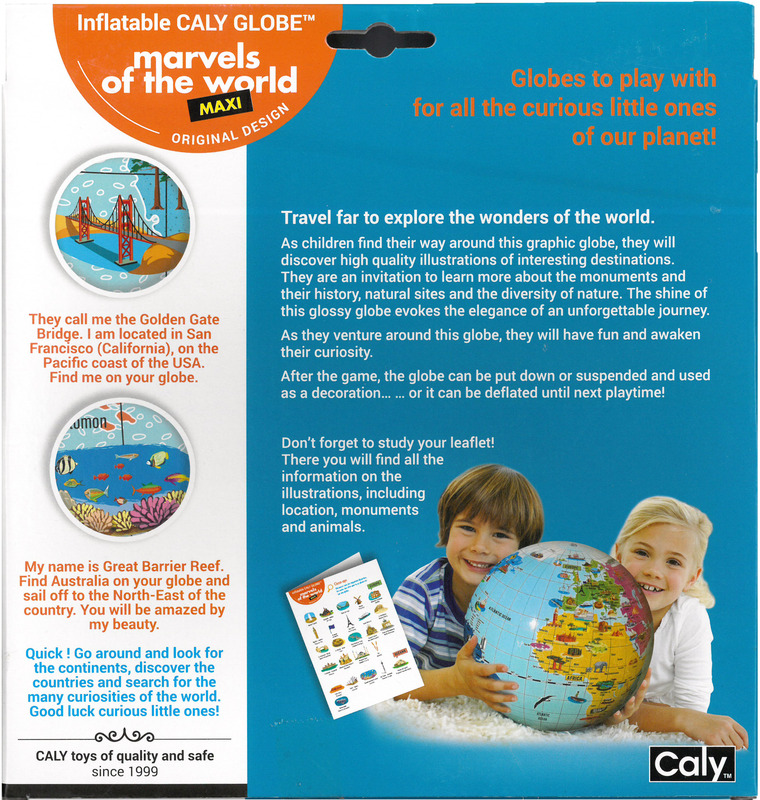 GIFT BOX: Caly – Toys has made a nice packaging that increases the added value of the product. It’s a nice cubic box (16.5 x 16.5 x 16.5 cm): thanks to this colour box, we want to differentiate the product from the other CALY globes which are more permanent toys than Birthday or Christmas toys as Roly Poly is. My Roly Poly Planet is using the same “shiny” printing technique as with the new 30 cm globe. These inflatable "ROLY POLY Planet" globes are sold per package (6 pieces) (price per piece in catalogue, please order by multiples of 6).